Nottinghamshire succumbed to a 203-run defeat against Hampshire, ending their hopes of the Championship title. 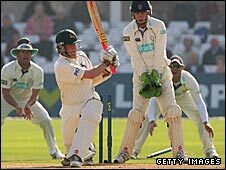 Notts, who lost the Pro40 Division One title to a final ball six, began this last match with an eight point lead. But Liam Dawson completed his maiden first-class century as Hants rattled up another 73 runs in 18 overs and set them 442 in a minimum of 76 overs. Samit Patel made 77 and Chris Read hit two sixes in 47 but Dimitri Mascarenhas and Imran Tahir took four wickets each. With Durham quickly recording victory at Kent, Notts knew that they would also have to win in order to be champions. But Hampshire were in no mood for a generous declaration, and batted on for 70 minutes to amass 449-5 before Mascarenhas finally called his batsmen in. Maybe the best way to develop a resistence to leg spin is to get one in the team - anyone know a leg spinner who is coming available for next year? Dawson's previous best score was 38 but he looked assured at the crease, firing angular seamer Charlie Shreck for consecutive boundaries, a six over extra-cover followed by a crunching off-drive. When he recorded his hundred with a nudge off the pads, Mascarenhas announced the declaration, leaving Notts with a herculean task. 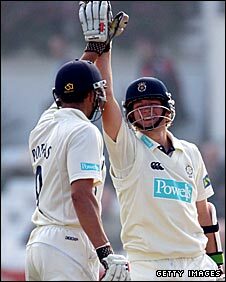 Graeme Swann was promoted to open, and after three early boundaries he was bowled playing an ungainly stroke. Mark Wagh fell two balls later, caught at second slip, and Will Jefferson, who hit a series of drives into the gaps created by having six slips in place, was caught at mid-off as Mascarenhas claimed his third wicket. That became four when South African left-hander Ashwell Prince gave him a low return catch in the eighth over of the afternoon. Patel then began a fine counter-attack, reaching fifty after four fours in an over from left-arm seamer James Tomlinson. He shared 94 with Bilal Shafayat, but the indefatigable Mascarenhas ended that with a fine running catch from mid-wicket to give left-arm spinner Liam Dawson a first wicket. Shafayat mis-hit a drive at Tahir shortly afterwards and was also caught by the Hants skipper, as Notts reached tea six down needing a further 235 from 31 overs, which, despite Read's bold cameo, proved way beyond them. Mascarenhas was delighted with his team after they captured third place. "It was a brilliant effort," the all-rounder said. "We were staring at relegation so to get up to third is a tremendous effort. "The way we have played our cricket all year has been to win and it was no different here." Read was magnanimous in defeat and paid tribute to champions Durham, commenting: "The side with the most wins has won the Championship and that's how it should be." Of his own side he said: "The seam bowling attack has stayed free of injury and has been the best I have seen at Trent Bridge in my 11 seasons. "But when we last won the Championship in 2005 we batted a whole lot better. "That's the sort of thing we need to get back to - but three of the top five batsmen were different this season and we are a side developing."